A cozy space where Blues, Jazz, Swing, Jump, R&B, Jive, Soul, Funk and Gospel plays from the Tannoy speakers and you can spend your time as you please. On Live Music Days, good entertainment unfolds right in front of you. During your travels in Japan, stop by for an unforgettable experience. We look forward to meeting you one day. 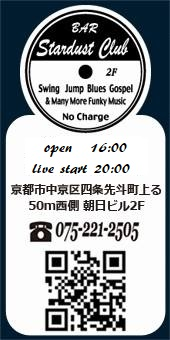 ◆　On Live Music Days there is a music charge or a tip is welcome. From Kawaramachi Station: Go East from exit 1A. Then, before the Shijyou Ohashi Bridge there is a Police Station. Turn north onto the street after the police station; the entrance to Pontocho. Go north 50 metres to the Asahi Building and Stardust Club in on the second floor. On the first floor is a Yakitori restaurant and to our south there is a restaurant called Sukiyaki Iroha. From Gion Shijyou Station: Go West from Exit 4. Cross the Shijyou Ohashi Bridge and at the Police Station turn north into the Pontocho Entrance. Go north for 50 metres. From Sanjyou Station: Go west from Exit 6 and cross the Sanjyo Ohashi Bridge. Enter the small street between the Lawson's convenience store and Kamogawa River and, with your back to the tabacconist, turn south down Pontocho. Go east along Shijyou Dori Road. Pass the Matsumoto Kiyoshi drug store on the corner of Kiyamachi street. Turn north into the road after the police station (before the Shijyou Ohashi Bridge). Go north 50 metres. The street between the tabacconist and the police station is the entrance to Pontocho. Enter the street and go north 50 metres. ©stardust club since1995. All Rights Reserved.